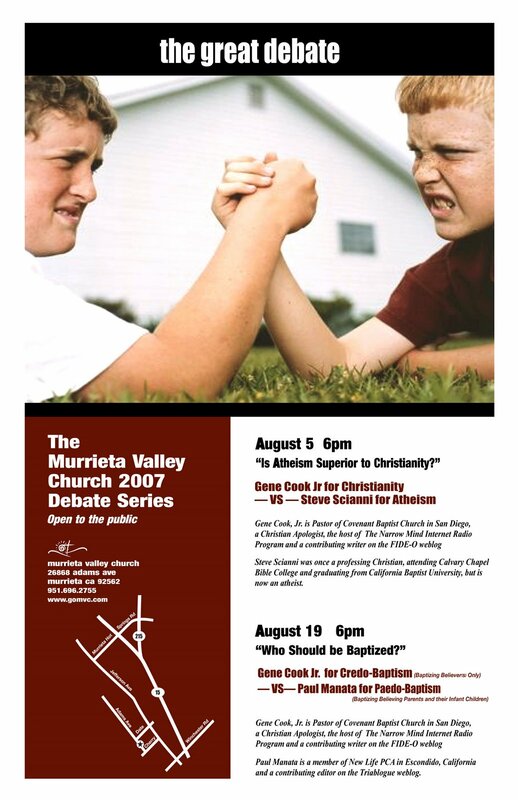 Gene Cook of UnChained Radio will have two great debates coming soon..
Pray for the debate with the atheist on August 5th, that the Gospel will be shared and that the foolishness of nonChristian Worldview will be demonstrated. Applying Presuppositionalism against Secularism by showing who can account for specific observations derived from the books on Harry Potter. I thought this might interest some of you out there. I had military commitment, but I should be more free now to blog! ZANZIBAR (Reuters) – Fishermen in Zanzibar have caught a coelacanth, an ancient fish once thought to have become extinct when it disappeared from fossil records 80 million years ago, an official said on Sunday. Researcher Nariman Jidawi of Zanzibar’s Institute of Marine Science said the fish was caught off the tropical island’s northern tip. “The fishermen informed us they had caught this strange fish and we quickly rushed to find it was a coelacanth,” he told Reuters, adding that it weighed 27 kg (60 lb) and was 1.34 meters long. The coelacanth, known from fossil records dating back more than 360 million years, was believed to have become extinct some 80 million years ago until one was caught off the eastern coast of South Africa in 1938 — a major zoological find. None has since been caught in South African waters, but around 30 have been caught in recent years off Tanzania, possibly because diminishing shallow-water resources have forced fishermen to cast their nets in the deeper waters where coelacanths live, experts say. Coelacanths are the only living animals to have a fully functional intercranial joint, a division separating the ear and brain from the nasal organs and eye. The unbeliever laughs to think we believe the earth was created in 6 days. The Christ-conquered (brainwashed) mind of the believer finds it hilarious to think the unbeliever can say the opposite with a straight face in all-seriousness and sincerity. You found a 360 million year old species of fish, a fish that was thought to be extinct the last 80 million years, but who’s extinction was voided in 1938 and present day??? As usual it comes back to the presuppositions and consequential clash of entire worldviews. What do I speculate? The fish seems old because it was a pre-flood fish that survived the flood. Of course that then dates the fish to less than a million years old (assuming the earth is less than a million years old as well), and most athiestic worldviews would reject the possibility immediately.